A man who went to the doctors complaining of earache was horrified to discover he had a family of cockroaches living in his ear. Not only was there a big mummy cockroach taking up residence in his ear canal, but she had spawned 25 little baby roaches. The 19-year-old patient, known only as Mr Li, had gone to hospital after his ear became itchy and painful. 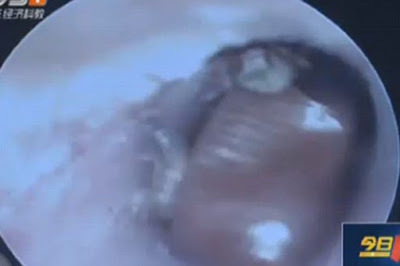 Doctors took a look inside his ear and were shocked to discover it was crawling with tiny insects. They believe the female cockroach went inside Mr Li's ear several weeks before laying her eggs. Doctors said that had Mr Li not come to hospital in time, his ear would have been "destroyed". 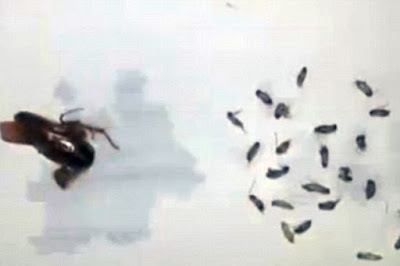 Yang Jing, a doctor from Chang'an Xiaobian Hospital in Dongguan, told TVS: "We saw an insect-shaped object blocking his ear canal completely." Cockroaches, who are often pitched as the only creature that would survive a nuclear explosion, are hardy insects that can survive for months with no food.